The words Due Process are often used in and out of the courtroom but many people, even some attorneys, surprisingly don’t understand or can’t explain it. Due process ensures that legal proceedings operate according to established rules and principles that are designed to protect the rights of private individuals, specifically the right to a fair hearing and the right to know what actually constitutes a crime (notice). There are actually two due process clauses that are contained in the Amendments to the United States Constitution. There is one in the 5th Amendment that applies to the federal government while the one in the 14th Amendment technically that applies to the states. Within the 14th Amendment there is also the Equal Protection Clause that requires individual states to give all persons, regardless of their origin, the same treatment under the law. 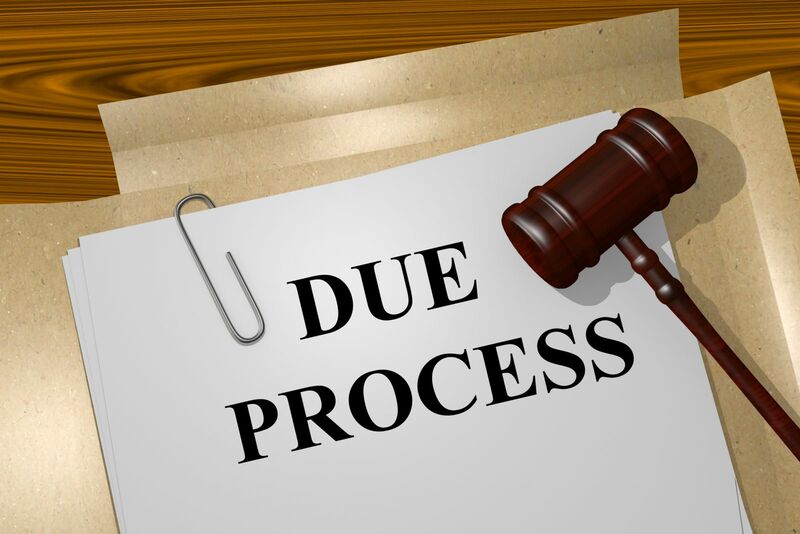 There are three types of due process violations: procedural due process violations, substantive due process violations, and the void for vagueness doctrine. Substantive Due Process means that laws must be fair and reasonable in content and must further a legitimate government objective (public health safety and welfare, etc.). Substantive Due Process protects citizens and the general public from laws which seek to limit or hinder fundamental rights (free speech, etc.). Procedural Due Process requires that a person always receive notice of an action against them as well as a hearing to address that action. At that hearing, the person has a right to be heard by speaking up directly or through an attorney (right to counsel) which is protected by the 5th and 6th amendments). Void for vagueness means that a law violates due process even though it provides for a person’s rights because it’s unclear what actually constitutes a crime. The void for vagueness doctrine means that a person of average intelligence must be able to understand what a law prohibits and what type of behavior constitutes a crime. In Pennsylvania, a criminal statute must clearly define an offense so that enforcement of the law is neither arbitrary nor discriminatory. What Can Your Criminal Defense Lawyer Do For You? Your criminal defense lawyer should always evaluate potential due process violations in your criminal case. This evaluation is important regardless of whether you’re charged with a felony or misdemeanor crime because the Pennsylvania and United States Constitutions contain these protections for all offenses. Even prior to trial, your criminal defense lawyer attorney should look at Due Process issues that could arise during pre-trial motions such as a Motion to Suppress evidence or even at a bail hearing immediately following your arrest. Most Due Process violations will focus on procedural violations like the lack of notice or perhaps the lack of bail hearing within a reasonable time following an arrest. If you questions about criminal law concepts, you should watch one of my videos or read one of my books in the free download section of this website.